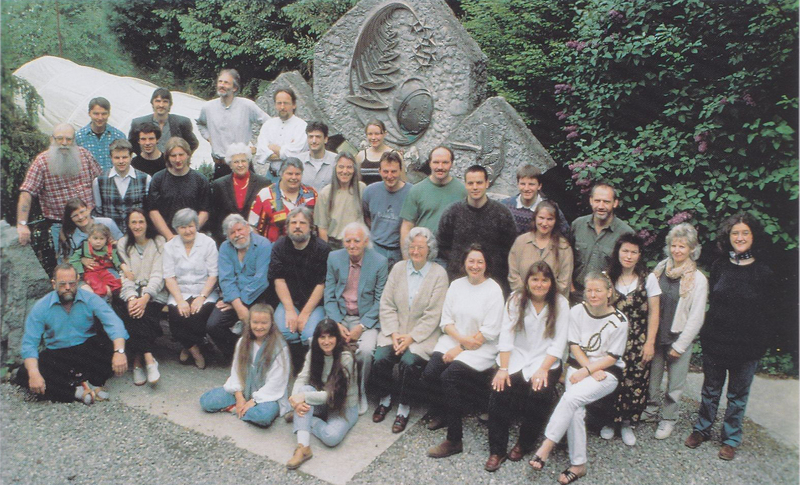 Billy Meier and Core Group-49. Source: Armin Grässl (20/05/2000), Photobuch (pg. 81, 2001). Sitting in the second row (L to R): Eva Bieri holding Selina Beiri, Edith Beldi, Maria Wächter, Engelbert Wächter, Louis Memper, Guido Moosbrugger, Elisabeth Moosbrugger, Andrea Grässl, Simone Holler, and Brigitt Keller. First row standing (L to R): “Billy” Eduard Albert Meier, Atlant Bieri, Stephan A. Rickauer, Brunhilde Koye, Bernadette Brand, Karin Wallen, Christian Krukowski, Freddy Kropf, Günter Neugebauer, Barbara Harnisch, and Conny Wächter. As time passed, some members of his study group who were skeptical have simply left, while others who were either on-the-fence or sympathetic to the Meier’s story had stayed around. In 1975, on advice of the Plejaren ETs, Meier has transformed his informal metaphysical study group into a group that is now called – Freie Interessengemeinschaft fur Grenz- und Geisteswissenschaften und Ufologiestudien (aka Free Community of Interests for Fringe and Spiritual Sciences and Ufology), otherwise known as FIGU – in order to help him with publishing and distributing his documented experiences, facts, spiritual teachings and evidences of contacts. As the number of believers grew, so did Meier’s extravagant claims and his purported extraterrestrial evidence. Many members of FIGU, who once closely lived or worked with Meier, over the years have left the group and disavowed their support to Meier/FIGU for a variety of reasons. For some, reportedly, it was the dubious and outlandish claims and the incriminating evidence of hoax that ended their affair with FIGU. But for others it was basically how the FIGU was run internally by its own members and their leader Meier who oversees them. These developments and many intricate details pertaining to the inner functioning of FIGU have led many to conclude that either FIGU is a cult or has many cult-like characteristics with Meier as its charismatic leader and his followers unquestionably embracing his self-proclamation of being the Prophet for the New Age, as well as for the entire Universe. Now, let us begin our investigation by considering a body of documented evidence that purports to show exactly that.